Ask Meg D: New Year, New Hair! I can say with absolute certainty that, given the opportunity, every woman I know would get a DRYBAR blowout every day! I can also say with absolute certainty that this is just not possible. But what is possible is to have the tools and products to help us replicate the DRYBAR Blowout style in the convenience of our own home. A set of essentials to create the prefect blowout at home. 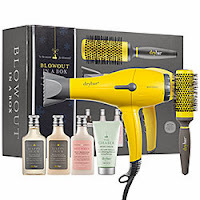 Buttercup is the official blow dryer used by more than 1,500 stylists at Drybar locations nationwide. It has been clinically tested and proven to dry hair faster than any other dryer available. It contains revolutionary nano bead technology which eliminates frizz and adds shine and luster. When combined with the Full Pint Medium Round Brush, Hot Toddy, and Drybar's Blowout Shampoo and Conditioner, the result is a perfect, long lasting blowout. The products in this set are cruelty-free and are formulated without gluten.